After nearly 3 years of living in Cape Town, I've finally gathered an appropriate amount of information to write a 'Things To Do' list. I've chosen to avoid the regular tourist hotspots (Camps Bay, Lion's Head, Promenade, V&A Waterfront, Cape Point, Boulder's Beach etc etc) and bring to you some of the perhaps less well-known but in my mind, even more amazing sights. And although I feel that there is way more still to discover, here are some of my favourite things to do! Although I said that I wouldn't include any of the ones that are on everyone else's list, this is the one exception. Whether you hike up there or take the cable car, this is definitely one of the must-dos in Cape Town. I've been up there a number of times and can safely say that the view never ceases to amaze me. 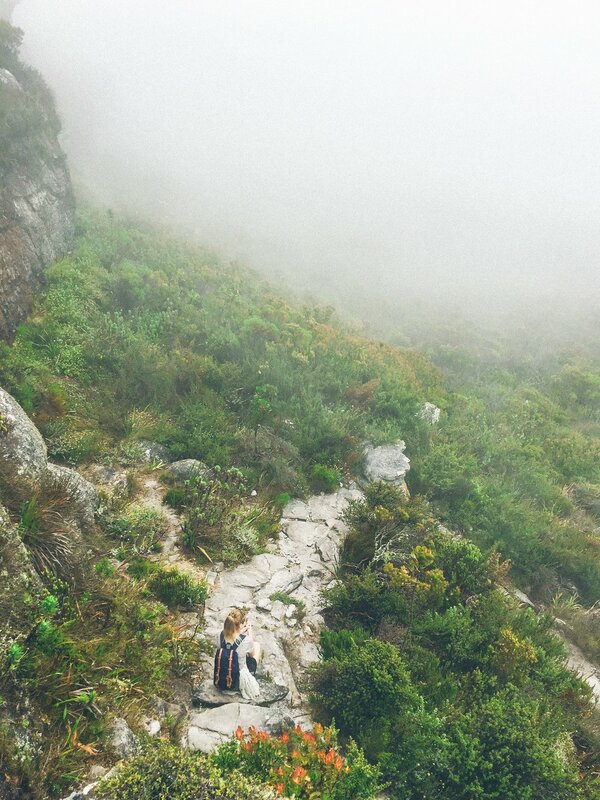 The best way to see the mountain is by hiking up - take the Skeleton Gorge route from Kirstenbosch. You get to see some of the most amazing nature going up - from waterfalls to rivers on the top with orchids growing around them - as well as getting a nice workout! The start of the hike is pretty steep so consider taking it slow, especially in the heat (thankfully the path is shaded most of the way). Once you reach the top however, it is quite an easy trek to the other side where you can catch a cable car down (or hike down if you legs can still carry you). The trip up takes about 3-4 hours, walking at a medium pace. If you are thinking that a hike may be too much for you then I can safely say that once you are on top of the mountain, you will absolutely not regret taking the long way up. I should also mention here that hikes around Cape Town should ideally have their very own section on my blog - it is my favourite way to spend Sundays and see the beauty that this area has to offer! If you are interested in hikes in and around Cape Town, then this is quite a good article to browse through. Although this isn't a 'thing to do' per se, it would be really sad if somebody came to Cape Town and missed this beautiful drive. It starts from Noordhoek and ends in Hout Bay (or the other way around) and has some of the most beautiful views in the area. I love taking snacks with me and sitting on the edge of the rocks while watching the sun go down - truly magical! The Chapman's Peak hike is also worth doing - it is moderately difficult but has the most superb 360 degree views on the top! This gorgeous nature reserve has a huge dam that you can hop into to cool down and is encompassed by one of my favourite hikes in the area - the path to the Elephant's Eye Cave. It is an easy walk/hike with only the final bit up to the cave being a bit more tricky but the views are absolutely worth it! The cave is huge and it is the perfect place to have a picnic and enjoy the views. This is one of the most gorgeous scenic drives in the Cape and is dotted with many beautiful beaches, whale-viewing sites (it is the start of the Whale Route!) and a penguin colony at Betty's Bay that is much better in terms of non-smelliness and tourist-trapness than its companion Boulder's Colony in Simon's Town. Not to mention that the route ends with Hermanus which is a beautiful town in its own right, with amazing whale watching opportunities and really beautiful wine estates! Kalk Bay and the neighbouring St. James are lovely little seaside villages. We often go there for a slow stroll on weekends - there are street stalls, quaint boutiques, colourful boats, good food and an abundantly welcoming atmosphere all round! Seal Island is definitely something that needs to be seen to be appreciated - home to over 60 000 cape fur seals, big ones and babies alike, it isn't as much an island as it is a big rock. The ferry costs around R100 and starts from Hout Bay Harbor - there are lots of boats to choose from, all working around the clock (daylight hours), and the trip lasts about an hour. You're guaranteed to see so many cute seals and if you're lucky you might even spot some whales or dolphins too! There are quite a lot of markets in the general Cape Town area all through the week, so I've chosen to highlight my favourite, The Oranjezicht Market, which takes place every Saturday, rain or shine, from around 8:30am to 2pm near the V&A Waterfront. They've got amazingly fresh local produce for sale, really nice food for vegans and non-vegans alike, and a really nice atmosphere for just taking it slow on a Saturday morning. Be sure to get one of the olive sticks from Woodstock bakery and the red lentil hummus from Aramoun! You can't get around coming to Cape Town without seeing and spending some time at one of its numerous beaches. There are quite a few really nice ones, but our favourite is Llandudno beach. It's just a short drive away from Camps Bay towards Hout Bay, and is the perfect amount of hidden while still playing host for enough people to not feel too secluded. - Uva Mira Mountain Vineyards - Set on the high slopes of the Helderberg Mountain Range, about a 15 minute drive from Stellenbosch, Uva Mira's grapes are grown at quite a high altitude compared to other places in the region, giving their wine an outstanding taste - in my humble option at least. I've been there too many times to count over the past years, enjoying their amazing wines and equally spectacular views. - Cape Point Vineyards - This wine estate has really good wines, nice views and a lovely atmosphere, given that the restaurant and tasting area is situated around their very own reservoir. Get some wine and pull up a blanket on the grass for an impromptu picnic. - Beau Constantia - Another really lovely setting, this vineyard estate has amazing wines and exceptional views. They've also got a top-notch restaurant there - Chef's Warehouse Beau Constantia - that is well worth a visit! Be sure to make a booking ahead of time though, as they're often full. Babylonstoren is an Old Dutch farm with amazing restaurants, a huge garden in which they grow all of their own fruits and veggies, highly respected wines, a beautiful farm stall and luxury accommodation. I feel like this paragraph is not nearly enough to put in words how much I love this place - you can read more about it in the blogpost that I wrote here. Finally, you absolutely must pay a visit to this awesome deli shop run by an effortlessly astute and always-smiling sister/brother duo. They have an exquisite selection of both South African and international goods, all hand-picked by them, including lots of vegan stuff! They've even got vegan croissants and donuts there if you are lucky (although they sell out really fast!). There is definitely lots more to see and do around Cape Town that isn't on this list. I feel like I should write down everything, while at the same time keep it compact and readable. Is it even possible to do both? In any case, check back here soon to see if I've added another not-to-miss activity to this list!